Plenty of Parking | Midtown Development, Inc.
With no on-site parking outside of the garages within the units, people often ask about guest parking. The short answer is that there’s plenty of it within a half block. 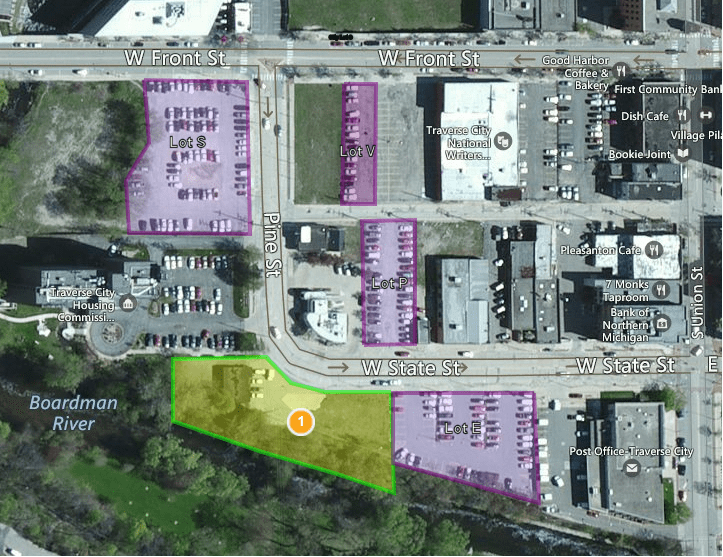 Short term parking is available on the street and right next door in City Lot E. Overnight parking is allowed by permit Lots E, P, V and S. Permits for surface lots can be purchased by the month ($44), quarterly ($114) or yearly ($390). Deck parking costs a bit more. Permits are available from the Parking Authority, located in the Hardy Parking Deck across from the Park Place. Permits can be moved from vehicle to vehicle, even. The City wisely controls all the surface parking in the downtown area. Within the next couple of years, they plan to gather up as much of the surface parking in the neighborhood and stack it in a deck. Expect than within the next couple of years, still within half a block of Uptown. That will eliminate the blight while making room for more development and add to the vibrancy and the tax base of the city. A very typical urban approach. City living is different: you can walk instead of drive everywhere. You might even be able to shed a car! This entry was posted in Area Information, News, Uptown-Riverfront living downtown TC and tagged Boardman river condos, Condo developments traverse city, new condominiums traverse city, Riverfront Condos, Riverfront Townhomes, traverse city condos, Uptown Condominiums, Uptown Condos, Uptown Traverse City. Bookmark the permalink.